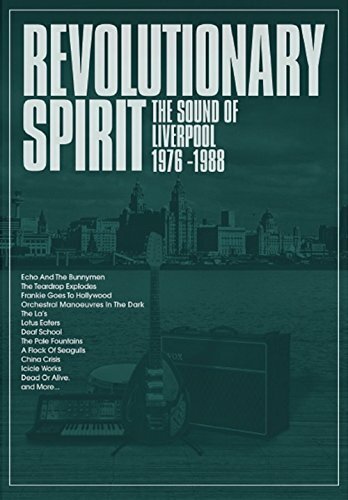 Discussions Magazine Music Blog: SPAZ reviews REVOLUTIONARY SPIRIT: THE SOUND OF LIVERPOOL 1976-1988! SPAZ reviews REVOLUTIONARY SPIRIT: THE SOUND OF LIVERPOOL 1976-1988! Any music or pop culture fan will immediately think of The Beatles when the city of Liverpool is mentioned. However, there is a lot more to Liverpool’s musical history than the Fab Four and their Merseybeat contemporaries (Gerry & The Pacemakers, Cilla Black, The Searchers, Billy J. Kramer & The Dakotas, etc.). The city also gave us Liverpool Express, half of Badfinger, The Scaffold (featuring Paul McCartney’s brother Mike McGear) and loads of other worthwhile artists. While the city will always be closely associated with kickstarting the British Invasion of the ‘60s, Liverpool’s musical renaissance in the late ‘70s had just as much an impact on the history of Rock music. And REVOLUTIONARY SPIRIT: THE SOUND OF LIVERPOOL 1976-1988 is a reminder of just how exciting, important and influential this city was… and is! Punk leveled the musical landscape in 1976, putting the power of music back into the artist’s hands. Being an independent label and operating a DIY business became a badge of honor. Major labels still had control of the charts but indie labels became respected cottage industries, releasing singles and albums that still influence listeners today. With this new-found freedom and independence, new music scenes sprouted up in cities all across the UK, most notably in London, Manchester and, not surprisingly, in Liverpool. The Beatles may have left the city behind more than a decade before but that didn’t stop Liverpool from continuing to be one of the most exciting musical breeding grounds in the world. “It was 1978 when I first played in Liverpool at the now legendary Eric's club, followed by the Masonic Pub, Kirkland's Wine Bar and The Lincoln's Inn and many others that sprung up in its wake. All very different places but all catering for the Post punk/New Wave scene that had taken hold of the city. The city wasn't as friendly in those days as it is now but everyone seemed burdened with the same insecurities and that made us a gang however cool or reluctant some people were. The city was exciting and vibrant and I loved the fact that bands from the other side of the world came to play at a dingy little downstairs club in Matthew Street.” – Les Glover (Liverpudlian musician). REVOLUTIONARY SPIRIT: THE SOUND OF LIVERPOOL 1976-1988 focuses on an extraordinary music scene that gave the world Pop hitmakers like Frankie Goes To Hollywood, Orchestral Manoeuvres In The Dark, Black, A Flock Of Seagulls, China Crisis, The Lotus Eaters, The Teardrop Explodes, The La’s, Echo & The Bunnymen and The Icicle Works, most of whom are still active on the scene today. The set also includes bands that made a huge impression on the music scene but may not have reaped commercial rewards including Yachts, Modern Eon, Hambi & The Dance, Dalek I, The Pale Fountains, Lori & The Chameleons and many others. Not only does this set feature some of the finest music recorded during this period, it also reveals how interconnected many of these acts were. Legendary ground-breaking outfit Deaf School not only kickstarted the scene, they split up and gave us Original Mirrors, Clive Langer & The Boxes and other acts featured here. The Wild Swans split and members formed Care and The Lotus Eaters. Henry Priestman (solo and The Christians) is featured here as a member of Yachts, It’s Immaterial and The Chuddy Nuddies and later recorded with Echo & The Bunnymen. The little known – but highly influential – Big In Japan featured Holly Johnson (later of Frankie Goes To Hollywood), Ian Broudie (Original Mirrors, Care, Lightning Seeds), Budgie (Siouxsie & The Banshees), Jayne Casey (Pink Military, Pink Industry), David Balfe (The Teardrop Explodes, Dalek I Love You) and others. Peter Burns was a member of both Nightmares In Wax and Dead Or Alive. And all of those connections are just the tip of the iceberg! From the quirky jive of “What A Way To End It All” by Deaf School to the joyful bravado of Post-Punk classic “Birds Fly” by The Icicle Works (and everything in between), this is one hell of a collection. Within these walls, you'll find everything from Punk to Dance music - each band a self-contained unit creating unique and riveting sounds. The music tells the true story of the city – from the dark, cold grind of early minimalist electronic and indie music of the ‘70s to the sparkly, brash productions of the ‘80s. REVOLUTIONARY SPIRIT is the sound of a city that never stopped evolving after The Beatles moved to London. Liverpool’s musical heritage did not lie on the shoulders of the Fab Four – it continued to thrive in the hands of the music makers that frequented the clubs, alleys, pubs and shadows of the Mersey beast*. It was always theirs… and that is where it will always be. This is a brilliant overview of a time when music was just as important as breathing to many of the artists collected here. On REVOLUTIONARY SPIRIT, there is darkness and light in equal measure. The music is emotional and adventurous. It is original yet strangely familiar. If you are expecting a plethora of Beatles sound-alike bands, then you are in for an uncomfortable listen. If you want to hear the spirit an industrial city filled with immensely talented musicians, then come visit Liverpool over and over again via this five CD collection. It is fair to say that this collection represents the heartbeat of the city much more than RUBBER SOUL ever did. * - nicked from Ian McNabb's MERSEYBEAST album title!